Click here to view the 2014 Annual Update in a web-ready format. 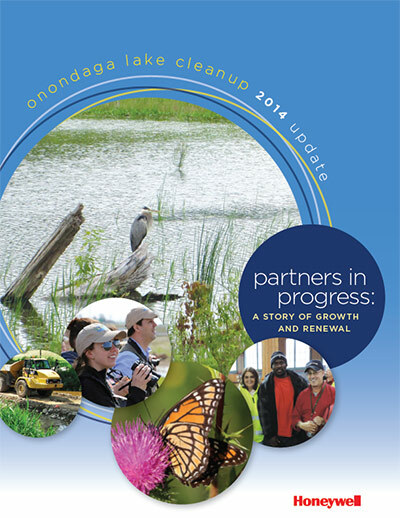 Onondaga Lake is a story of growth and renewal. Wildlife is returning to restored wetlands and Honeywell finished dredging in 2014. Capping and habitat enhancements will be completed in 2016. The early completion was the result of focused execution of a carefully designed project plan by hundreds of scientists, engineers, and skilled craft laborers. Nearly 90 percent of the workers live in Central New York and about 80 percent of project materials were supplied by New York State businesses. The hard work of creative, knowledgeable, and dedicated professionals and members of the Central New York academic community has been critical to the success of this project. Thousands of Central New Yorkers have learned about the cleanup by touring the Onondaga Lake Visitors Center along the southwest shoreline. In addition, hundreds of volunteers have joined the Onondaga Lake Conservation Corps, a partnership among Montezuma Audubon Center, Onondaga Audubon Society, Parsons, O’Brien & Gere, and Honeywell, and become environmental stewards protecting the Onondaga Lake watershed. We invite you to join us. We are proud of the historical milestones we have achieved and hope you share our excitement as you read our sixth annual update. You can learn more by visiting our website at www.lakecleanup.com.